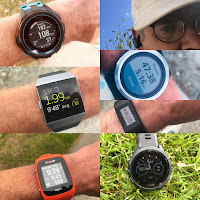 Road Trail Run: MioGlobal MioLink Review: Wristband Heart Rate Monitoring. Finally no Chest Strap! MioGlobal MioLink Review: Wristband Heart Rate Monitoring. Finally no Chest Strap! 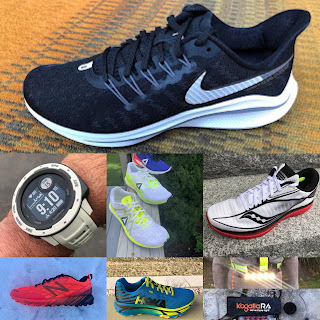 I have had a number of chest strap type heart rate monitoring sensors and have never used them consistently due to their discomfort and the strap fussing. I recently purchased the $99 MioLink, a wristband that monitors heart rate. The MioLink is small and unobtrusive. It comes in 2 rubber size straps. I picked the large for my very small wrist and can't imagine very many people needing the smaller size. The sensor slips out of the back of the band so the band is replaceable, washable. 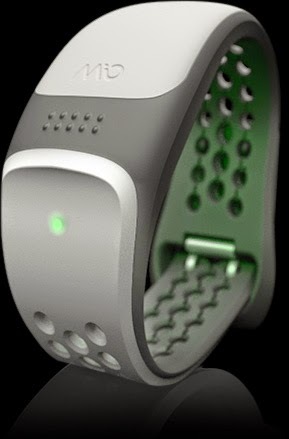 Mio monitors heart rate as follows: "Integrated into the back plate of a wristband or watch, the LEDs shine light into the skin, which enables the electro-optical cell to detect your pulsing volume of blood flow." So far seems to work fine and at long last the nasty strap is gone! I have now run 4 times with the MioLink. I have noticed a bit of inconsistency (fast heart rate reading) the first 5 or so minutes of runs something I have also seen on occasion with my Wahoo Bluetooth Smart chest strap. Otherwise the MioLink seems very accurate and useful. Suggestions: my sense is the accuracy is more consistent if you keep your iPhone and its recording app out of a back pocket. Keep phone on the front of your body somewhere. I have noticed that if you synch MioLink to your app and then wait for more than 15 minutes or so to start the app, connections may be lost. I am not sure this is to the iSmoothrun app I use or to the Magellan Echo. Battery life is claimed to be 8-10 hours. Charging is via USB dongle. Water resistant to 30 meters. DC Rainmaker has a very complete review here of a pre production version of MioLink.